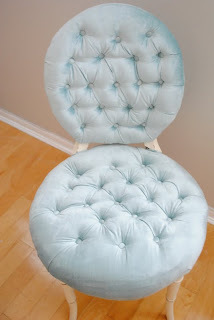 We found these chairs a while ago at the Faith Farm Thrift store for $4.00 each. They were pretty crusty. I pointed them out to my sister and she loved the idea of them, but oh, they were bad. 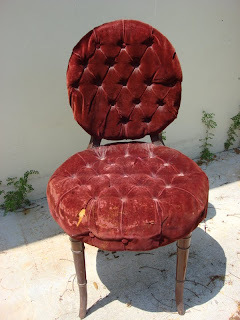 The velvet was in horrible condition and the foam was disintigrating, but for $4.00, whatever. 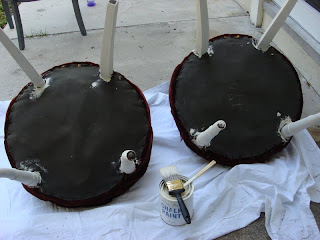 I painted the legs using Annie Sloan Chalk Paint in Old White. I gave them two coats and then sanded down them down a bit to get the aged look. We had them refoamed and reupholstered. There was no way I would attempt this on my own. My sister bought a high quality upholstery blue velvet from a local fabric store. It was kind of pricey at $35 a yard, but the quality and texture of the fabric seemed worth it. It's hard to tell in the photograph. I didn't want to destroy the fabric, so we left it to the professionals. 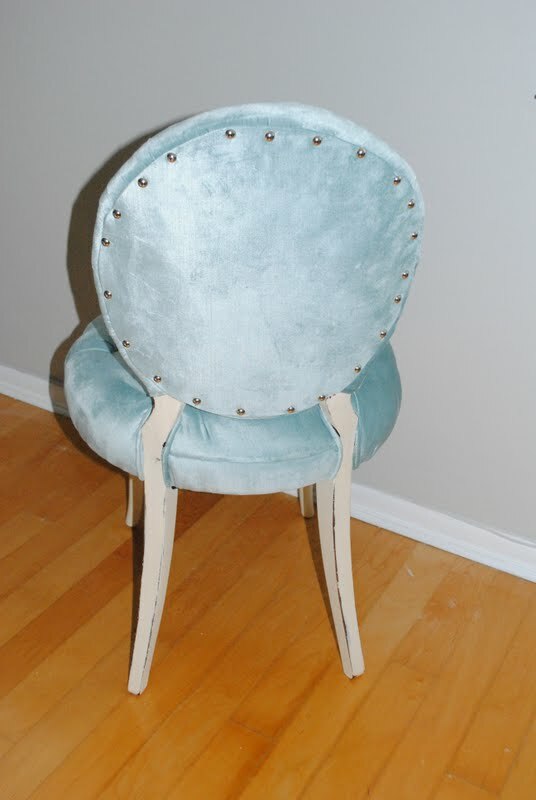 Here's the back of the chair with a few nailheads. Pretty, right? 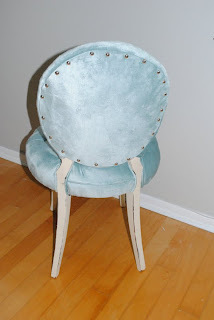 They will be used in my sisters dining room along with the two chevron chairs and the Turquoise Chandelier. The crazy thing is, my sister has decided to rent out her apartment and move to Paris for 6 months. After all that work! I think I've figured out why I'm so exhausted lately. I'm back at work, trying to workout (which I am now doing Crossfit and it WEARS me out), some other crazy stuff, and trying to wrap up all the projects for my sister's place. I am beat. Writing that just got me even more tired. I'll be photographing my sisters apartment this weekend. We weren't able to finish everything, but it is a huge and adorable transformation. Have a great weekend. LOOVE it! those legs are awesome and the blue is too sweet! OMG! What a difference a little paint and new fabric makes. I love it! Great job. Super cute. Love the new color. Great eye! The fabric looks so pretty. SO SO COOL! I love the way they came out!!! Just found your blog, i love your projects! What a great sister you are! Gorgeous! I recently inherited a very similar chair. You have inspired me!!! These look great! Love the fabric...totally worth the investment, in my opinion. 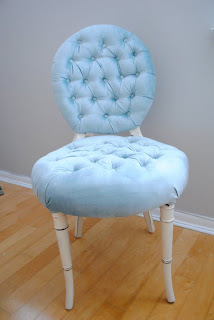 I am a new visitor and follower from Salvage Savvy! Oh, my, that chair looks insanely good. Want to park it at my place for awhile!? Wow that's a lot of tufting! Amazing job! Love the color too. 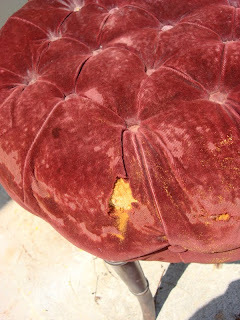 Your sister's dining room i going to look great.